The Philippine Army (PA) - Department of Science and Technology (DOST) initiated project restoring a two-hectare coral reef or 20,000 coral fragments in Nogas Island, Anini-y, Antique is up for completion. This project was started early this year by the Philippine Army's 3rd Infantry Division together with the 301st Infantry Brigade and 82nd IB based in Miag-ao, Iloilo in an effort to help restore the damaged coral reefs in Nogas Island in Anini-y, southernmost municipality in the province of Antique in partnership with the local government unit headed by Mayor Reynaldo Pollicar. 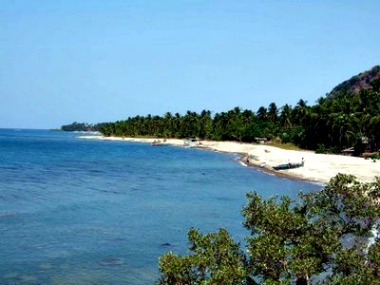 Nogas Island is considered as a marine sanctuary in Antique. It is about 3 kms off the coast of Anini-y proper. It is a popular birders destination and is surrounded by pretty sand beaches and a flourishing mangroves. It has been known as an ideal diving site for scuba diving enthusiasts and a potential tourism haven in the future. The partnership of the Phil. Army and the LGU was made possible with the assistance of the Department of Science and Technology and the University of San Carlos through the 'FILIPINNOVATION' program in National Coral Restoration. This program aims to promote science-based coral reef management; establish technology pilot demo sites for coral restoration and propagation; and establish innovative scaled up model for coral reef enhancement using electric mineral growth (EMG) technology. According to a DOST official, the project in Nogas Island is very important not only to DOST but also to the people of Anini-y because it has an island to be proud of. It has beautiful coral reefs that need to be taken care of and protected. On the part of the Army, it has committed to help the people of Anini-y boost their economic capacity by enhancing their tourism potentials at the same time protecting their marine and aquatic resources. With the partnership established among various agencies and stakeholders, poverty which is identified as the root cause of insurgency will be addressed through job generation, protection of marine resources and improvement of its potential. In an interview with LTC. Aldwine I. Almase, Battalion Commander of the 82nd IB who has direct supervision of the coral reef restoration project in Anini-y, said so far about 6000 coral fragments has already been planted in the area out of the targeted 20,000 fragments by December. They also have started filling the 2nd Coral Nursery Units in the restoration site. Non-diver volunteers from the coastal barangays near the site had also helped in the restoration work. There is an on-going information and education campaign with league of barangays, fisherfolks and people in the community so they will appreciate more the coral restoration project being undertaken and be responsible for its upkeep. Next week, the project will be inaugurated with high ranking officials from the Philippine Army, DOST, Office of Sen Loren Legarda, and provincial and national government officials, LGU of Anini-y, the community itself in attendance.